Around five years ago, I was in a village near Chernobyl. Bad Ukrainian electropop was hissing out of the car radio as we drove north towards the Exclusion Zone fence. I was frantically writing PhD research notes while we bumped along an uneven road. I scribbled thoughts about an interview I had just had in a nearby village. My voice recorder was full of the memories, hopes and uncertainties of the veteran liquidator I had just spoken with, who knew Chernobyl like the back of his hand. He had handed me a disposable camera that I had given him a few months back. The device was sat on my lap in the car with a bag of other single-use cameras. They were full of images that would help create a photo story I called ‘Disposable Citizens’, which aimed to see Chernobyl from the perspective of those who live with it (see Davies 2013). A cat looks at his owner as he takes a picture. One of the photographs from the Disposable Citizens photography project. Photograph by research participant near Chernobyl. 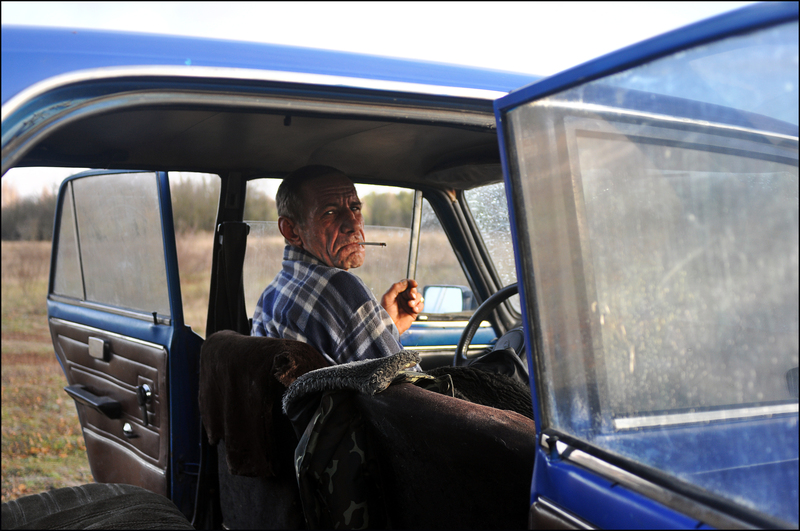 Wiping away the condensation from the car window, I could see abandoned collective farms rushing past, fields stretching out to the horizon, as the lower Pripyat Marshes gradually filled the flat landscape with reeds and boggy ground. On one side of the road a Soviet War memorial commemorating the Great Patriotic War stood with flaking silver paint. I would later learn of another memorial nearby, which marks a mass execution of local Jews that took place in the Pripyat Marshes during Nazi occupation. Later interviews with elderly residents of the Chernobyl hinterland would be full of lived and inherited tales of partisan resistance, the Holodomor famine, and the chaos in the 1990s after Ukrainian independence. The 1986 Chernobyl nuclear disaster would not be the first or last event to disrupt this rural landscape. ‘It was then, sat in a car not far from the Chernobyl Exclusion Zone fence, that I heard for the first time the word: ‘Fukushima’. As we made our way through the ‘fenceline’ villages towards the next interview, the radio’s repetitive electropop suddenly stopped. An announcer had cut-off the music for a news flash: as he spoke I could just about hear the words ‘Chernobyl’ and then, curiously – ‘Japan’. I did not understand? What was happening? It was then, sat in a car not far from the Chernobyl Exclusion Zone fence, that I heard for the first time the word: ‘Fukushima’. Over the next few days I attempted to carry on the ethnographic research as normal; interviewing residents who live on the edge of the Exclusion Zone; discussing how they dealt with toxic uncertainty; listening to people talk about being abandoned by the state, and observing their coping strategies and local expertise. We shared meals and opinions about living in this nuclear landscape, but Fukushima kept coming up in conversation. ‘Did you hear what happened in Japan?’ said one lady, before warning against the perils of forced evacuation. Others hoped Japan would not make the same mistakes the Soviets had. In these conversations there was much empathy from those who had experienced nuclear disaster first hand, towards the recent victims of Fukushima. Despite the great cultural and geographic distance between the two worst atomic disasters, a transcontinental solidarity emerged. Three years later I spent the summer in Japan researching Fukushima. What I found was eerily familiar: Exclusion Zones; uncertainty; evacuation; hazmat suits; border guards; Geiger counters; misinformation; grief; loss; and confusion. ‘What is going to happen? What will be the long-term effects?’ asked a Fukushima evacuee as we sat in a café in central Tokyo. With a colleague from the University of Tokyo kindly acting as a translator, I explained the difficulties of providing epidemiological proof of Chernobyl’s health impacts, but I also mentioned how virtually everyone I had met near Chernobyl had stories of illness and death relating to the nuclear accident. As Olga Kuchinskaya rightly reminds us in her article in this special issue, ‘the lack of evidence does not necessarily mean the absence of effects’. Like the flicker of a candle, anniversaries come and go. They briefly shine light on to something – placing it momentarily in the public conscious – before attention moves elsewhere. Inevitably, tragedies such as Chernobyl and Fukushima fade back into the shadows. In the last few weeks we have seen many media articles covering the two nuclear disasters. The 30th anniversary of Chernobyl and five years since Fukushima has given us all pause for thought, to consider the significance of these technological accidents. But as the media coverage fades, and the world’s attention moves on, there remains a growing group of scholars dedicated to researching ‘the power of nuclear things’ (Hecht 2010). Nuclear geographers, atomic sociologists, toxic historians, and many more disciplines beyond are continuing to contribute to our collective understanding of the social construction, interpretation and significance of nuclear things. This Special Issue of Toxic News features articles written by a range of academics that have dedicated many years to focus on the nuclear, and have been kind enough to share some of their thoughts here. This Special Issue presents thoughts and research from a range of perspectives; from scholars such as Gabrielle Hecht whose fascination with the nuclear stretches back to the 1970s, to upcoming nuclear scholars such as Yohie Koyama and Nathaniel Ray Pickett, who are conducting fieldwork in Japan and Ukraine (respectably) as we speak. Gabrielle Hecht takes us back to her teens and remembers the omnipresence of the Cold War in her youth before she became a ‘nuclear nerd’. She describes searching through nuclear archives from France to Gabon that were ‘replete with silences’. Olga Kuchinskaya provides a snapshot of her fascinating STS research into the ‘politics of invisibility’, while Sarah Phillips has written four thought provoking poems inspired by her long-term anthropological research about Chernobyl. Nick Rush-Cooper writes an engaging account of his PhD research and discusses the confluence of computer games and the otherworldly experience of tourism in the Chernobyl Exclusion Zone. Liz Maly gives a detailed account of some of the social impacts of the Fukushima triple disaster, reminding us that more people from Fukushima have died as a result of stress related to displacement than directly from the earthquake or tsunami. Similarly, Yohei Koyama gives a captivating ethnographic account of his research in Japan, inspired by Freud’s notion of ‘the uncanny’. Nam Young Kim reflects on the political fallout of the Fukushima disaster in China, while Nathaniel Ray Pickett provides an interesting perspective from the ‘last nuclear monotown’ near Chernobyl in Ukraine. Together, these nuclear voices give a fascinating account of on-going research and emerging avenues of enquiry. Thom Davies conducted long-term ethnography near Chernobyl for his PhD and later undertook qualitative research in Fukushima with JSPS funding. His most recent academic publication about Chernobyl can be found here. Thom is working on the project ‘Toxic Expertise’ at the University of Warwick. His Chernobyl photography can be accessed here and you can follow him on twitter here. Cover Image: a woman who lives near Chernobyl shows a photograph of her deceased husband who worked as a ‘Liquidator’. She believes he died because of exposure to harmful levels of radiation. Photograph by Thom Davies. Davies, T. and Polese, A., 2015. Informality and survival in Ukraine’s nuclear landscape: living with the risks of Chernobyl. Journal of Eurasian Studies,6(1), pp.34-45. Hecht, G., 2010. The power of nuclear things. Technology and culture, 51(1), pp.1-30.